Lemons, curds and way too much heat. A lady at work brought in two huge bags of lemons from her mum’s tree and I eyed them off, thinking, can I take the lot and not be seen as greedy? What if I take the majority of them and promise the office a treat made from them? Yes? Yes. This gave me the perfect opportunity to try lemon curd. 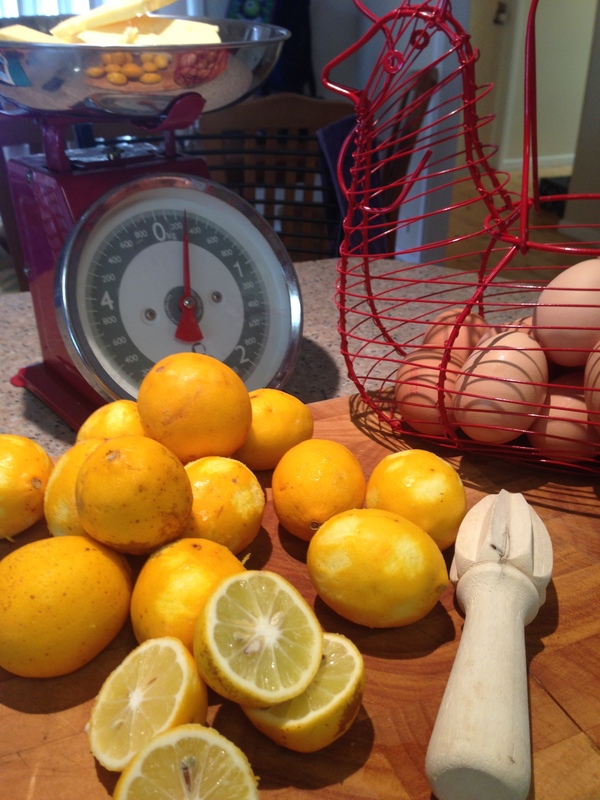 I’m taking a number of jarred items to a big family reunion at Easter in Coonabarabran, and lemon curd is a favourite amongst the older clan members. How much juice was I to get out this many lemons? Not as much as I’d first thought actually. But, have daughter, will juice. 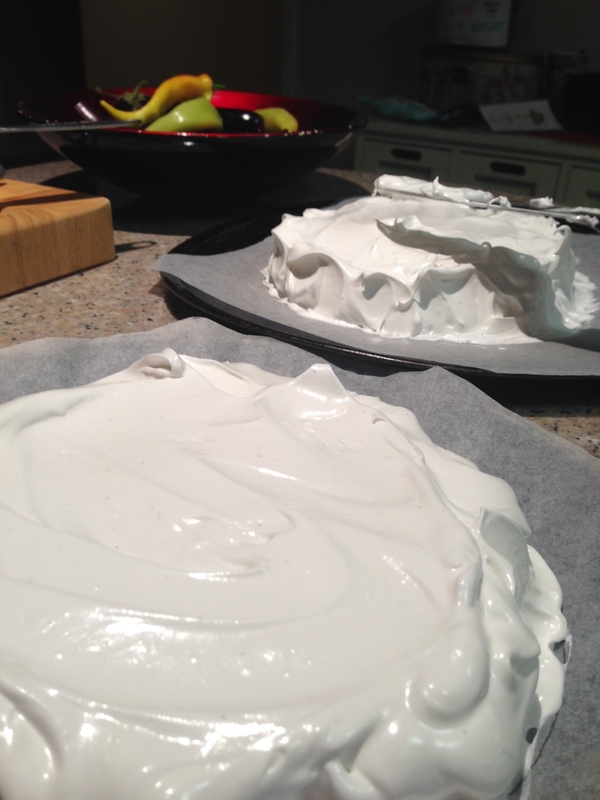 The curd recipe I followed is that of baking guru NotQuiteNigella. You may see a theme happening here with her recipes, and it’s true, I am her blog stalker. I’m sure she doesn’t mind. Copyright is the sincerest form of flattery, isn’t it? I’ve not made lemon curd before and quite honestly thought, this is a walk in the park, right? Actually, it’s not. I was halfway through the second stage of melting the butter through the eggs and sugar and started to panic, thinking I had the heat too high and that I’d managed to cook the entire lot. Anyway, the lemon curd came good in the end. I separate my eggs through my fingers, messy but it works. 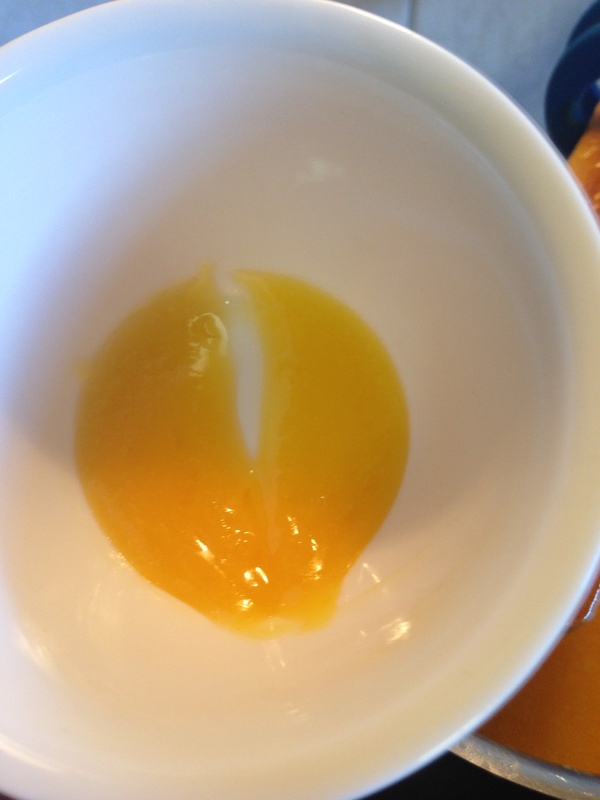 Whites into one bowl, yolks into another. 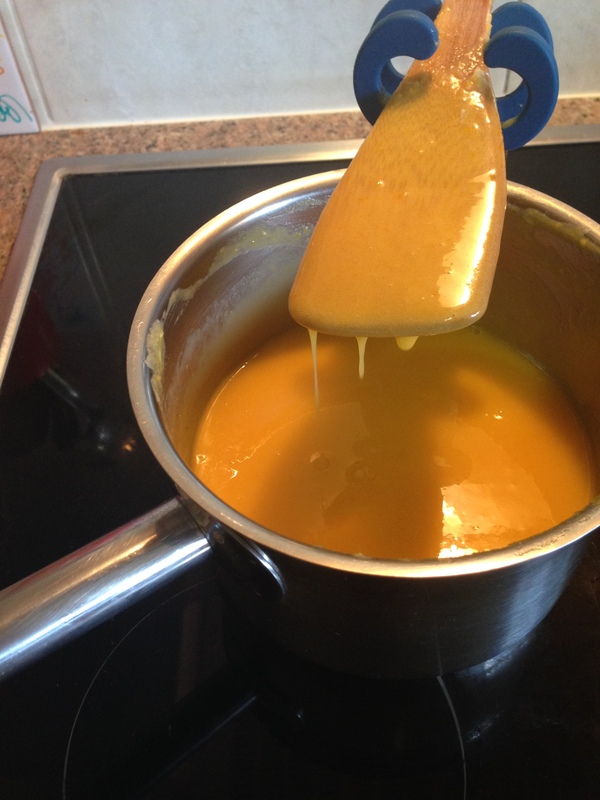 Whisk the egg yolks and sugar in a heavy bottomed saucepan before it gets to the heat. For first timers, have the heat as low as possible without turning it off. That way, it’ll take longer, but you’re guaranteed to not cook the eggs. Add the butter and heat slowly until the butter melts, continuing to stir. Don’t panic if it looks like it’s curdled it’s just the ingredients incorporating prior to the butter melting. In the meantime zest the lemons until you have a couple of tablespoons worth. 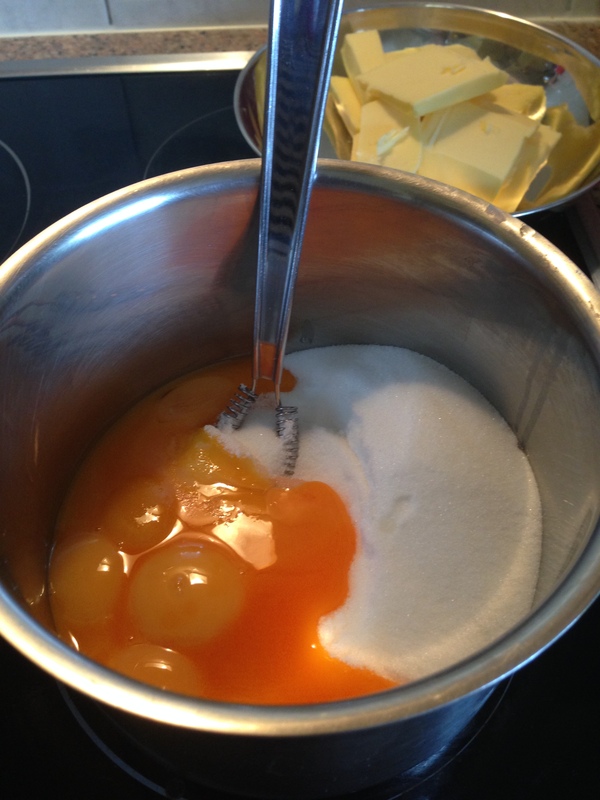 Add the zest to the egg yolk mixture. When the butter has melted add the lemon juice and whisk it altogether, increase the heat a little, cooking like a custard. Continue to stir until the mixture starts to thicken, I tested it by putting a small amount in the bottom of a cold bowl and as soon as I could keep a line through it, it was ready. I probably tested about 8 times. It took me about 30 minutes for it to thicken up, but I was erring on the side of caution with my temp on the stove. It will probably take you less time. It thickens considerably when cooled and will continue to do so in the fridge. I got a jar and a smidge out of the ingredients. 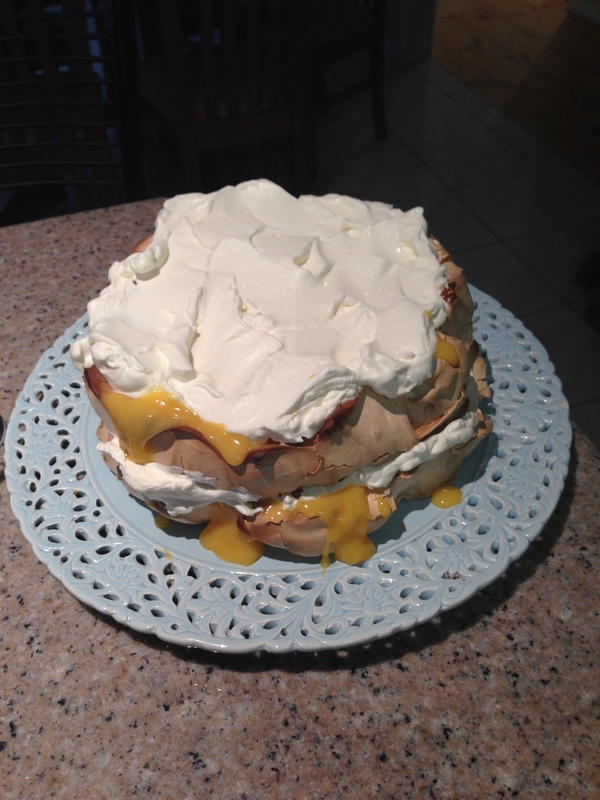 And I like to think my pav is caramelised, not burnt. Just caramelised. 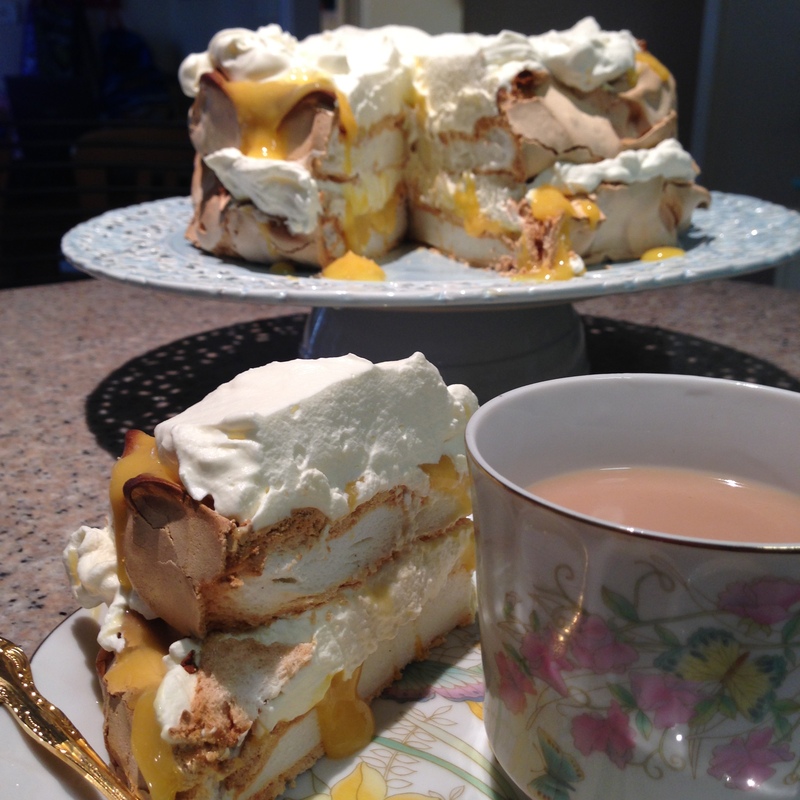 With layers of cream, curd and crunchy meringue you can barely make out the caramelised flavour. Seriously. There’s still plenty left to take to the office tomorrow.